You may have heard in the past that dogs’ mouths are cleaner than humans’. While it’s true that dogs are less susceptible to cavities, this doesn’t mean they are immune to the same dental problems as humans, such as tartar, plaque, and gum disease. While bad breath and yellow teeth might make your dog’s regular tongue baths a bit gross, this is not the main concern about canine dental health. Just like humans, when dogs have dental problems, it can lead to dangerous infections and chronic illnesses such as heart or kidney disease. Fortunately, there are plenty of opportunities to help your dog be as healthy as possible by maintaining their dental health. Again, dog dental hygiene is not too different from human dental hygiene. Brushing your dog’s teeth daily is the first line of defense against issues like gingivitis. If you have never brushed your dog’s teeth before, you might feel a bit intimidated. After all, when you’re sticking your hand in the mouth of anything with sharp teeth, it’s natural to have reservations. It helps to make sure your dog has gotten plenty of exercise and is reasonably tired before attempting to brush their teeth. This way, they are more likely to sit still while you do it. The first few times you brush your dog’s teeth, be sure to be very gentle and slow, and make sure to pay attention to your dog’s cues. If they look like they are getting irritated, it’s in your best interest to stop for the day, even if you haven’t gotten to the whole mouth. Over time, as you practice every day, your dog will get used to the sensation of having their teeth brushed, and you can be more thorough. Make the experience as pleasant as possible by petting them, speaking in a soothing voice, and rewarding them with a treat afterwards. Soon enough, they may even be excited to have their teeth brushed. Ideally, you will prioritize teaching your dog to accept tooth brushing from a young age. A puppy will be a lot more trainable to adapting to this kind of care. However, contrary to popular opinion, you can teach an old dog new tricks, so if your dog is older and you haven’t brush their teeth before, there’s still time to teach them. It’s very important to understand that human toothpaste is not safe for dogs. This is because it contains fluoride, which is poisonous to pets. Do not use human toothpaste on your dog. You can find dog toothpaste at any major pet stores. You can also help your dog’s dental health with the food you choose to feed them. Dry food is better for dogs’ oral hygiene because it is crunchy and doesn’t stick to their teeth like wet food. If brushing their teeth doesn’t go so well, feeding them dry kibble can be a good secondary step to prevent tooth decay. There are many chew toys that are specially designed to help your dog’s oral health. More than anything, make sure not to give them anything too hard to chew on, which can break their teeth. 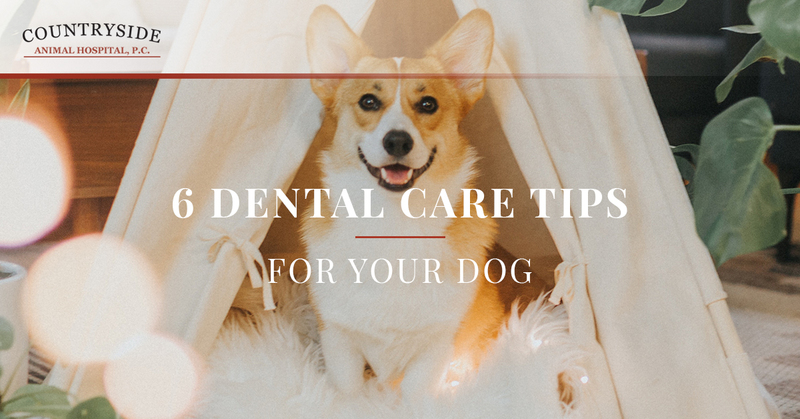 A good bone can be beneficial for helping your dog strengthen their teeth and gums, but is not sufficient alone to aid in their dental hygiene. It’s like a human who only chews gum and uses mouthwash — these habits alone will not help their oral health. Just like you, your dog needs professional health with their dental health every 6-12 months. A dental examination is part of your dog’s annual checkup, so if you have any questions about how to care for your dog’s oral hygiene, you can speak to your veterinarian in Fort Collins for more information about what specifically your pet needs. At Countryside Animal Hospital, we are happy to have the opportunity to help dogs be as healthy as they can be. If you need veterinary care for your pup, whether for a dental checkup or another concern, we would be happy to help. Contact your Top Rated Local® Fort Collins Vet today!